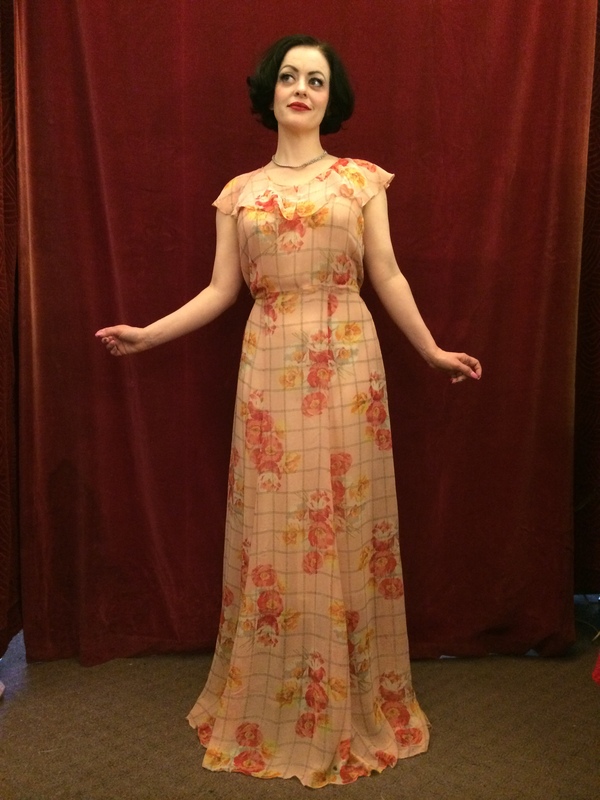 Increasingly, students ask me to help with assignments that they have on vintage or the history of dress or the industry – Jenny is one of these students and so to make things easier, I thought I’d answer her questions here. If my responses are of use to you, you’re most welcome to use them with accreditation. Thank you. How did your shop come about? Where can we find it? Basically, I’ve collected most of my life. I used to run a vintage shop in Sydney in the late ‘eighties and in 2003 noticed that it had closed down. Sensing an opportunity, I rang the owner and negotiated to buy it. Then we packed it all up, moved it to Melbourne – and set about working what to do. At first, I opened a stall at Chapel Street Bazaar but I wanted more than a hobby, I wanted a lifestyle – so a proper shop was needed. 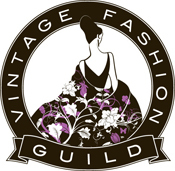 When did you start collecting vintage clothing? I’ve always worn vintage, ever since I was a kid (but we called them hand me downs then) and started seriously buying it when I was fifteen. 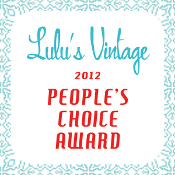 I went through the yellow pages and looked up all the vintage shops and checked them out – it was love at first sight. 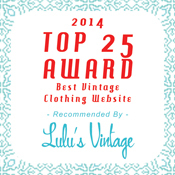 Has your view on vintage clothing changed since you first entered the business? How has the market evolved? Absolutely. After collecting for more than twenty years, I thought I knew a lot, but when it’s your every day existence, you see so much, talk so much, read so much, think so much more. I know at least ten times more now, than I did when I opened. As far as the market evolving, like every shop I have my niche. 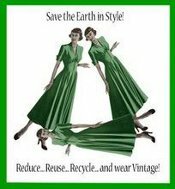 In general, I would say that there is more acceptance and awareness of the vintage market – and of course, environmentally, it’s profile will increase too. 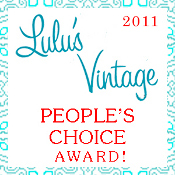 There are many reasons to buy and wear vintage, it’s great to see that appreciation. Describe your customer. Who are you selling to? My customers are men and women from 14 to 74 – people with a sense of style who appreciate good quality with a sense of history. Some are performers or artists, people who want interesting clothings or inspiration. Circa stocks clothing and accessories from the Victorian era to the 1980s: most are from the ’40s or ’50s, with less items from the ’20s-’30s and ’60s-’70s. Our preference is for the better pieces: dressier, more glamourous or well made from good fashion houses. All items are cleaned and fully restored, so they’re ready to wear. 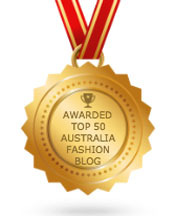 We source our stock locally, so Australian fashion labels are a specialty. Melbourne used to be the fashion hub of Australia so our racks represent the cream of the industry. We like to be able to present the whole range of accessories so that a whole outfit can be made up – for this reason, we also sell reproduction vintage accessories where the real thing is difficult or impractical, like braces for men and garter belts for ladies. How do you decide what to sell at any given time? Describe how you price your pieces. How much do your clothes cost? 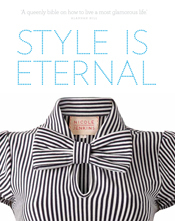 Our garments are priced on a range for type, style, quality, condition, size and fabric. For example, scarves are priced between $5-35, so a modern design in polyester with a small amount of damage will be at the low end and a 1930s floral rayon crepe will be at the top end. The same works for the other garment types. Do you sell both women and men’s clothing? Do you find that either market is stronger? We sell both, probably slightly more ladieswear, although we’re very fond of menswear and the chaps who wear it. It’s my dream one day to have a second shop, to dedicate to menswear, probably something a bit like Old Hat in London. Something reassuringly old fashioned and glamourous. Do you collect vintage objects other than clothing? Of course, I love many old things and our home is testiment to this – but I try to limit my collecting to clothing. An exception is Golora, a photograph from 1915 taken by Charles Gilhousen. Every photo is hand tinted, and so different – my parents had one when I was a child. I have six now. I can’t resist a good forage at an op shop, and rarely miss an opportunity but have to admit that rarely do I find anything of the requisite quality or era. I keep looking though, as you never know. What is the best piece you ever bought? “Best” is such a relative term – there are many amazing things out there. Perhaps it was the Paul Poiret hand painted silk coat, trimmed in monkey fur, or the 1930s evening gown by Schiaparelli, or the 1920s beaded Chanel frock that needs some serious restoration, or likewise, the 1930s Vionnet boudoir gown? I love them all, no matter how grand or ordinary. I hope that my answers are of use to you and your project! I love Poiret’s “Manteau D’Auto”. I’m actaully re-designing it for textiles class. It was from a local antique dealer – in retrospect perhaps I shouldn’t have sold it? It was amazing and went to a very talented fashion designer – I’m sure he’ll appreciate it! Nicole – you have six Gilhousen photos? How cool! We own 20+ and always like hearing about other folks who appreciate his works. Lenette – that’s amazing! I take it the twenty are different photos? I love all his work. Yes – all are different. Here is an older link to a site my ex put up. It’s missing a few photos, (both ones we have and ones we know of and don’t have) but at least gives you an idea of what’s out there. We began with 2 in the late 60’s and have struggled to find out more info about Gilhousen..
I’ve spoken to quite a few people looking for more information on Gilhousen, including a journalist from a Tasmanian newspaper – sadly, there doesn’t seem much out there. You have a great collection! I think that’s the best I’ve seen: they’re so beautiful. Golora is my muse, she sits above the counter in the shop. Hi Liz, many designers use vintage as inspiration: perhaps they copy it completely, or more usually “update” the design or put their own creative spin on it. In any case, it’s very difficult to faithfully reproduce vintage because many of the fabrics are either no longer being used, or expensive. As well, vintage tends to use a high amount of hand-finishing, something that is only done these days in couture. Then there is the fact that many older clothes were custom-made, so they either fit you very well or not at all – unlike modern clothes which come in set sizes. I love seeing vintage styles reproduced – they can often be a more cost effective (and lower maintenance) option to “real” vintage, and whilst some (like me) wish for the real thing, many are pleased to have something that creates the look and comes in a range of sizes and colours. That’s really interesting, never thought of it like that before! So would you say that a lot of ‘vintage’ sold in boutiques or vintage shops are the real deal? I mean there is only so much that can be circulated before we run out! And with its sudden rise in popularity how do you see its future? “Vintage” is becoming a misused word: some designers even call their current ranges “vintage” when what they really mean is “vintage style”! It’s becoming increasingly important to be able to make up your own mind about whether a garment is authentic or not – and that’s a big reason why I wrote my book Love Vintage. As far as running out, I keep hearing this but my biggest problem is that everyday, people offer me wonderful vintage to buy and alas, I can’t possibly buy it all – that said, some things are becoming quite rare and it’s only reasonable that more needs to be paid for them. As well, many older clothes are in poor condition and you need to make a decision about whether they can be resurrected, and if the work involved justifies the time and expense. That’s where people who are handy with a needle come in: they can see the value in something that is damaged and perhaps create something new from it, if it can’t be worn or repaired to it’s current state. I totally agree! I mean when I look at vintage I like it to be a good replica of that era and for it to really stand out. There is a difference between second hand clothing and true vintage and over time the definitions seem to have blurred and now anything from over 20 years can be vintage even if it is just an average tee shirt. Do you think that as these items get rarer and the condition of vintage means that items are unwearable that people are going to go back to old methods of customising and reusing some of their old clothes and making do with what they have, especially as individuality seems to be lacking from the high street with identical products featured in most stores. And do you think it has got harder to be unique with clothing? I mean there has always been trends but nowadays people seem less willing to stand on their own and be different. Liz, I think there are always creative people who will find ways to express themselves – for example, as a child I used to make dresses out of discarded umbrellas – much to the horror of my mother who wouldn’t let me wear them out in public. Interesting about Charles Gilhousen. I have four of his photos that were my grandfathers. I went to the website mentioned above but the email address to contact them is no longer valid. I was going to send them scans of mine. I have the one called Reflections and three others. Hi Nicole,am currently undertaking a research project on vintage and second hand clothes,and your post has rearlly answered some of my questions.my aim is to establish weather or not a second hand, no value, cast-off clothe can be sold as vintage.Does calling a used clothe vintage increase the value?or is vintage a facade to conceal felony??pls. yours or anybody else’s opinions will be highly appreciated. Ufuoma, as mentioned above, there are differing opinions about what constitutes “vintage”, it’s even used for brand new modern fashions! Perhaps calling something “vintage” increases it’s cache, but I find that people will buy what they like, regardless of how old it is. Simply being old isn’t enough to make it desirable: every era produces good and bad quality and designs. Nicole, i do agree with the fact that people will buy whatever they like, becos ultimately the choice and power lies with the buyer but any thots on how to discourage the sales of second hand clothes as vintage?? Ufuoma, I agree that there is an issue with people selling non-vintage as vintage but as I mentioned, the definition of “vintage” is a contentious one: I may say that certain products are not vintage, but if the seller holds a different definition, there is little that I can do, except start an argument! you have been very helpful Nicole. thanks.